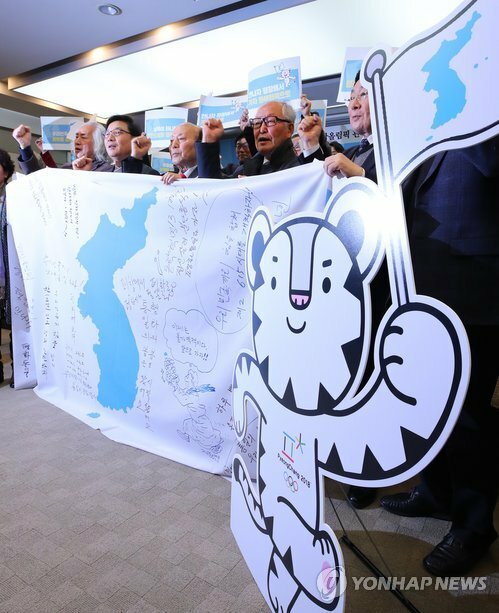 The head of the 2018 PyeongChang Winter Olympics organizing committee on Tuesday downplayed concerns over the planned use of the Korean Unification Flag, a joint flag symbolic of a unified Korean Peninsula, during the joint entrance of the two Koreas at the opening ceremony of next month's Winter Games. "I'm aware that there are many concerns over the joint entrance behind the Korean Unification Flag. But since we're the host nation, there will be a three minute performance with the Taegeukgi as the motif," Lee Hee-beom, president of the PyeongChang Organizing Committee for the 2018 Olympic and Paralympics Games, said during a press conference at the Main Press Centre in Alpensia Resort in PyeongChang, 180 kilometers east of Seoul. The Taegeukgi is the South Korean national flag. The International Olympic Committee and the two Koreas last week reached an agreement to send 22 North Korean athletes to compete in five events, including figure skating, in South Korea's first Winter Games. The parties also reach an agreement for Olympians from both the South and the North to march together under Korea Unification Flag -- with an image of the Korean Peninsula in blue against a white background -- in the opening ceremony. Lee's remarks came amid growing antipathy among conservatives toward North Korea's participation in the games after heightened tensions over its nuclear and missile tests last year. The main opposition Liberty Korea Party claims that whether to use South Korea's own flag is a matter of "national identity and pride," and that the absence of its flag will mask the efforts South Koreans have made toward the success of the sporting event. During the conference, Lee also pointed out that the Taegeukgi will be hoisted by Army honor guards at the Olympic Main Stadium and that singing of the national anthem will be included in the program for the opening ceremony. "The only difference is that the players (of the two Koreas) will enter together (under the Korean Unification Flag). That decision is based on the three previous joint Olympic entrances in the past," Lee said. He also stressed that none of the opening ceremony, other than the joint entrance part, was changed in light of the North's participation.